Spectral domain optical coherence tomography (SD-OCT) is a non-invasive imaging method which is used in the diagnosis and followup of various macular diseases. SD-OCT provides detailed imaging of the retina. However, it has also been used to evaluate the choroidal layers. There are many publications on the OCT terminology, the definition and classification of retinal and choroidal structures including lines, bands and zones described in OCT. The aim of this review is to provide an overview of the literature on the past and present terminology for the retinal and choroidal structures seen in SD-OCT. To know OCT terminology will provide to be understanding better the pathogenesis of these diseases and the effects of therapeutic applications for these. 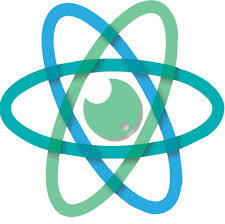 Burak Turgut has nothing to disclose with any trade or device in relation to this article. No funding was received for the publication of this article. This study involves a review of the literature and did not involve any studies with human or animal subjects performed by any of the authors. In this review, based on the literature, it has been aimed to provide an overview of the definition and classification of the retinal and choroidal structures seen in SD-OCT, and to propose the standard nomenclature and terminology for these structures. To know the INOCT, OCT terminology and nomenclature of retinal and choroidal layers, the landmarks, zones, bands and lines described in OCT in healthy eyes will also provide to be understanding better the pathogenesis of various macular diseases and the effects of therapeutic applications for these. In conclusion, to use the standardised and proper OCT terms in current OCT terminology might provide standardisation in the definition of important pathologies and to understand better the pathogenesis and the effects of therapeutic applications for various macular diseases. 1. 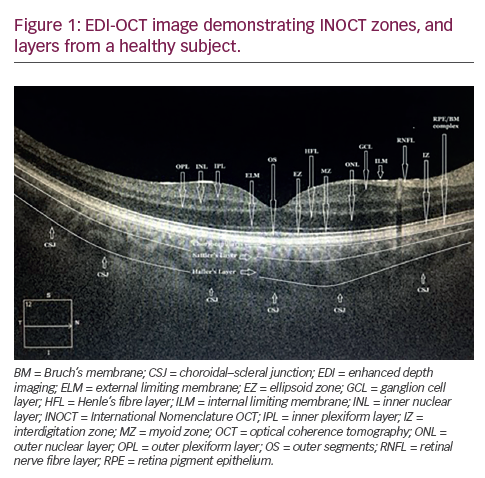 Arevalo JF, Lasave AF, Arias JD, et al., Clinical applications of optical coherence tomography in the posterior pole: The 2011 José Manuel Espino Lecture - Part I, Clin Ophthalmol, 2013;7:2165–79. 2. Gabriele ML, Wollstein G, Ishikawa H, et al., Optical coherence tomography: History, current status, and laboratory work, Invest Ophthalmol Vis Sci, 2011;52:2425–36. 3. Spaide RF, Curcio CA, Anatomical correlates to the bands seen in the outer retina by optical coherence tomography: Literature review and model, Retina, 2011;31:1609–19. 4. Staurenghi G, Sadda S, Chakravarthy U, Spaide RF, International Nomenclature for Optical Coherence Tomography (IN*OCT) Panel, Proposed lexicon for anatomic landmarks in normal posterior segment spectral-domain optical coherence tomography: The IN*OCT consensus, Ophthalmology, 2014;121:1572–8. 5. Turgut B, Demir T, The new landmarks, findings and signs in optical coherence tomography, New Front Ophthalmol, 2016;2:131–6. 6. Çıtırık M, ilhan Ç, Teke MY, Optical coherence tomography (Optik Koherens Tomografi), Current Retina (Güncel Retina), 2017;1:58–68. 7. Koh A, Optical Coherence Tomography of the Outer Retinal Layers. In: Coscas G, Loewenstein A, Bandello F (eds), Optical Coherence Tomography, ESASO Course Series, Basel: Karger, 2014;4:26–33. 8. Hogan MJ, Alvarado JA, Weddell JE, Histology of the Human Eye: An Atlas and Textbook, Philadelphia: W. B. Saunders, 1971;328–63. 9. Drexler W, Cellular and functional optical coherence tomography of the human retina: The Cogan lecture, Invest Ophthalmol Vis Sci, 2007;48:5339–51. 10. Pinilla I, Ruiz-Moreno JM, Cuenca N, Correlation of optical coherence tomography with retinal histology, Arch Soc Esp Oftalmol, 2012;87:275–7. 11. Drexler W, Morgner U, Ghanta RK, et al., Ultrahigh-resolution ophthalmic optical coherence tomography, Nat Med, 2001;7:502–7. 12. Fernandez EJ, Hermann B, Povazay B, et al., Ultrahigh resolution optical coherence tomography and pancorrection for cellular imaging of the living human retina, Opt Express, 2008;16:11083–94. 13. Otani T, Yamaguchi Y, Kishi S, Improved visualization of Henle fiber layer by changing the measurement beam angle on optical coherence tomography, Retina, 2011;31:497–501. 14. Lujan BJ, Roorda A, Knighton RW, Carroll J, Revealing Henle’s fiber layer using spectral domain optical coherence tomography, Invest Ophthalmol Vis Sci, 2011;52:1486–92. 15. Jonnal RS, Kocaoglu OP, Zawadzki RJ, et al., The cellular origins of the outer retinal bands in optical coherence tomography images, Invest Ophthalmol Vis Sci, 2014;55:7904–18. 16. Schaal KB, Rosenfeld PJ, The controversy of Band #2, 2015. Available at: www.retina-specialist.com/article/thecontroversy- of-band-2#sthash.FJSvgMyC.pdf (accessed 6 July 2017). 17. Srinivasan VJ, Monson BK, Wojtkowski M, et al., Characterization of outer retinal morphology with high-speed, ultrahighresolution optical coherence tomography, Invest Ophthalmol Vis Sci, 2008;49:1571–9. 18. Saxena S, Srivastav K, Cheung CM, et al., Photoreceptor inner segment ellipsoid band integrity on spectral domain optical coherence tomography, Clin Ophthalmol, 2014;8:2507–22. 19. Hoang QV, Linsenmeier RA, Chung CK, Curcio CA, Photoreceptor inner segments in monkey and human retina: Mitochondrial density, optics, and regional variation, Vis Neurosci, 2002;19:395–407. 20. Lu RW, Curcio CA, Zhang Y, et al., Investigation of the hyperreflective inner/outer segment band in optical coherence tomography of living frog retina, J Biomed Opt, 2012;17:060504. 22. Sherman J, Yannuzzi AL, Madonna RJ, et al., Photoreceptor Integrity Line: As Revealed by Spectral Domain OCT (eBook), New York: Lulu.com, 2008. 23. Verhoeff FH, A hitherto undescribed membrane of the eye and its significance, R Lond Ophthalmic Hosp Rep, 1903;15:309–19. 24. 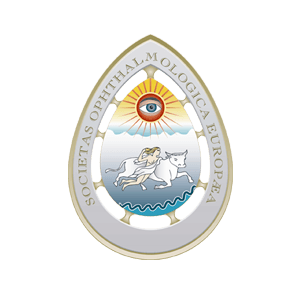 Wolff E, The external limiting membrane of the retina and its relation to Verhoeff’s membrane, Trans Ophthalmol Soc UK, 1950;60:61–7. 25. Huynh E, Chandrasekera E, Bukowska D, et al., Past, present, and future concepts of the choroidal scleral interface morphology on optical coherence tomography, Asia Pac J Ophthalmol (Phila), 2017;6:94–103.